My entire working copy of my genealogy file, presented with The Next Generation software, fully searchable database containing over 100,0000 individuals, supplemented with thousands of notes and media including cemetery and headstone photos, census records, and much more. This site traces all lines of my sons' ancestors; as well as many, many collateral lines, including neighbors, friends, in-laws, extended branches of the direct-line ancestors, and even a few family lines "just because." So, please check the surname index. Most lines reach back to the beginnings of the New World from mostly Great Britain, and Germany/Prussia; but virtually all - direct lines anyway - eventually find their way to Jefferson County, Texas. All of my direct-line ancestors throughout my paternal and maternal lines are indicated with an asterisk ( * ) following their given names. My sons' father's direct ancestors are so indicated with a caret ( ^ ). My paternal lines consist of Moyer/Snider Breckenridge, Skinner, families that settled in Southern Illinois, predominantly Sangamon and Christian Counties (see the Moyer/Snider Scrapbook). My maternal lines are Jones/Lovelady, settling in DeWitt, later Anderson County, Texas; Sherman/Stebbins, originally from Massachusetts, and Courts/Gentz and a whole band of interrelated families coming to Jefferson County, Texas, many to the Republic of Texas and before, from Opelousas in Southwest Louisiana. 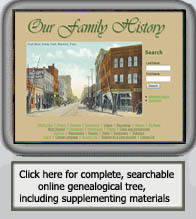 Other ancestors include Hayes, Burrell, Clark, Johnson, Forman, Comstock, and many others. Both lines of my sons' paternal lines predominantly settled in Pampa, Clay County, Texas. Paternal side are Oglesby/Gallagher who had settled in southern Arkansas; and the maternal side consists Ryther/Anthony coming from New Mexico. This compilation of data has been ongoing for over 20 years, utilizing my own research, other family members' research, researchers who have generously shared their data, and data that has been ferreted out from the Internet. As with all genealogical work, it is a work in progress that will never be completed in this lifetime. This file is my working copy, and I am constantly adding to, tweaking, adjusting. So, check periodically for added information. Personal Scrapbook of William and Rose Snider Moyer, containing about 280 photos and spanning over 100 years. They were both from Illinois, he from Springfield, she from Morrisonville. 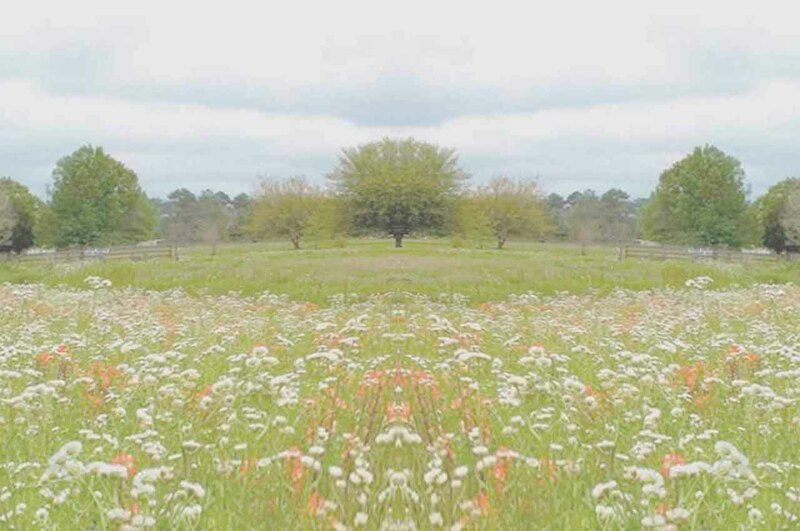 In their early married life, they settled in Beaumont, Texas, where they lived out their long and full lives. 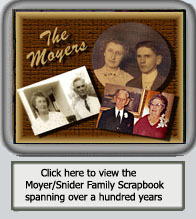 Though the Moyers' and Sniders' genealogies are fully contained within Our Family History, this site is a collection their Scrapbook of photos and other items that my grandfather had saved. When he died in 1982 at the age of 91, my parents found boxes of all these items, not in any particular order. My son John, being quite good at organizing such things, was asked to take them all home with him and put together a scrapbook, which he was delighted to do. This is the digitation of that resulting scrapbook. Some of the photos were even on glass templates that had to be specially developed. The people portrayed in them were not identified, but we know enough to know they were family. It's a wonderful collection, and I hope you will enjoy perusing through it. William, better known as Will, was born in Cropsy, Illinois, and grew up in and around Springfield. Rose grew up nearby in Morrisonville, Christian County, Illinois. Soon after their first son, Raymond was born, they moved to San Antonio, Texas, where my father, Robert Moyer, was born in 1921. After a short period in San Antonio, they returned to Illinois briefly, then came back to Texas, making Beaumont their home for the rest of their lives. Both Will and my dad were dummers; and Will was quite active with the Magnolia Refinery Band, as well as the Beaumont Civic Band and Orchestra, of which my dad was also active in his younger adult years. The scrapbook deals with Rose and Will's lifetime together, as well as family members in both Illinois and in Beaumont, Texas. Regarding their genealogy, Will was the son of Harold Charles Moyer and Flora Breckenridge. The Moyer family descended from Jacob Mayer, c 1605, who lived in Switzerland. His grandson, Hans Georg Mayer, Jr., was our immigrant who came from Wurttemburg, Germany to Germanna in Orange County, Virginia. The generations of Moyers that followed married into the Vogt, Blackburn, McGowan, Stone, and Breckenridge families. Rose Snider Moyer, was the daughter of Joseph Abraham Snider and Irene Francis Skinner. Her ancestry includes Snider and Skinner, of course, as well as Nichols on her paternal side and Randles, Compton, Chaney, Wood, Howard, among others on her maternal side. Copyright notice: You are welcome to use and share whatever information is posted here for your personal use, with only the request that you give credit by linking back to this source. Absolutely nothing here is to be used for any sort of profit, whether to publish in books, pamphlets, CDs, or any medium to be sold, or any fee-based Internet sites.